Virginia is for lovers! 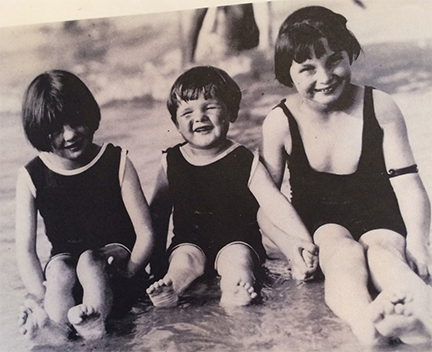 Stories from my Pretty Southern road trip. I needed to take a breather and just get out of town. There’s something about Atlanta in the summertime with the city’s haze, mugginess, and omnipresent traffic even if the schools are out, and it’s enough to make a girl downright claustrophobic. I decided to hit the road in honor of my 20-to-infinity birthday (I’ve stopped counting from here on out). Here’s the story of my Pretty Southern road trip. 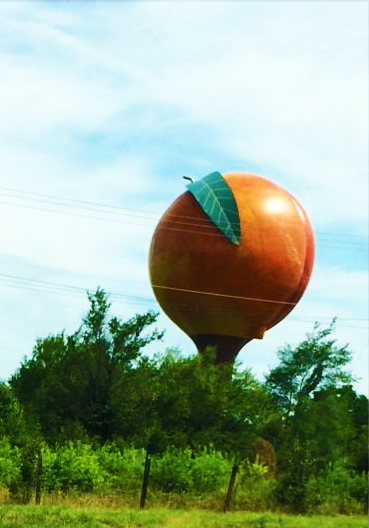 The Peach in Gaffney, S.C. Where’s Frank Underwood? I drove a little over 1,100 miles across the South through Georgia, the Carolinas, and southern Virginia. For those of y’all unfamiliar with the route, picture it like this: from Atlanta, hit I-85 North where Georgia’s hills give way to the wide waters of Lake Hartwell and Lake Keowee as you cross into South Carolina. For the next three hours you drive through barren valleys of I-85 dotted with peach farms, pecan trees, and the occasional outlet mall as you head on to Charlotte. After hitting the Queen City, you climb alongside the Appalachian mountains with exits pointing to some of the South’s most prestigious universities: The University of North Carolina – Chapel Hill, Elon University, and yeah that Duke school (sorry Dukies but my father grew up in Chapel Hill – Go Heels!) Just past Raleigh, you start to see towns with names like “Norlina” announcing the border with Virginia. As you get closer to the border, the foothills become lake country and farmland filled with green crops. This part of the journey was a bit of a homecoming for me. I was born in Virginia. The first 10 years of my life were spent here, and yet I hadn’t been to the great VA in at least five years – back when I was still Lauren Morgan. Roughly 90% of my kin lives in this neck of the woods. I do firmly believe that Virginia is for lovers. When my grandma says ‘Bless your heart’ she means it with all of hers. 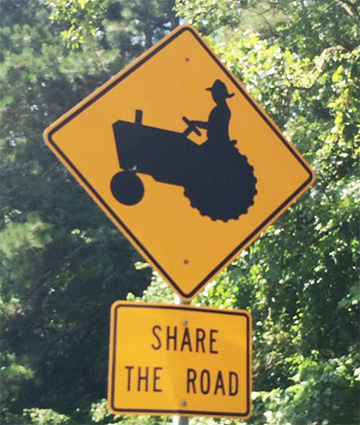 On Highway 58 there’s tons of these signs reminding you to share the road with the tractors. My first night of the Pretty Southern road trip was spent at my grandmother’s house in the tiny town of Windsor, Va. It’s in the middle of nowhere along Highway 58 – which is basically the main road linking all the farm towns of southeast Virginia leading to the Atlantic Ocean. You drive through tiny tobacco towns until you finally hit Windsor. Blink and you’ll miss it. There’s maybe a dozen stoplights in the whole town, and that might be a stretch. Her house backs up to the baseball field of Windsor High School. She’s lived there since I was born and has a Southern accent as thick as molasses. Angela Sun pointed out that I say “If I had my druthers” a lot during the work week, and it turns out I have Granma to thank for that. Yes, that’s “Granma” because when she could still drive that’s what was on her license plate. I spent the Night #1 with Granma and my uncle Jim noshing on a carry out pizza. For Day 2, I woke up at 7 a.m. on the morning of my 20-to-infinity birthday and went for a run in her backyard at the Windsor High School track. We drank coffee while she did a crossword and I read a Pat Conroy novel while movie reruns played in the background. For my birthday lunch, I treated us to Dairy Queen and rewarded myself to an M & M blizzard. Calories don’t count on your birthday. The past few months have been so busy with eating, drinking, and running around Atlanta that it was amazing to spend a few quiet moments with people I love. That afternoon I said a tearful goodbye and headed west to meet my husband in Danville, Va. 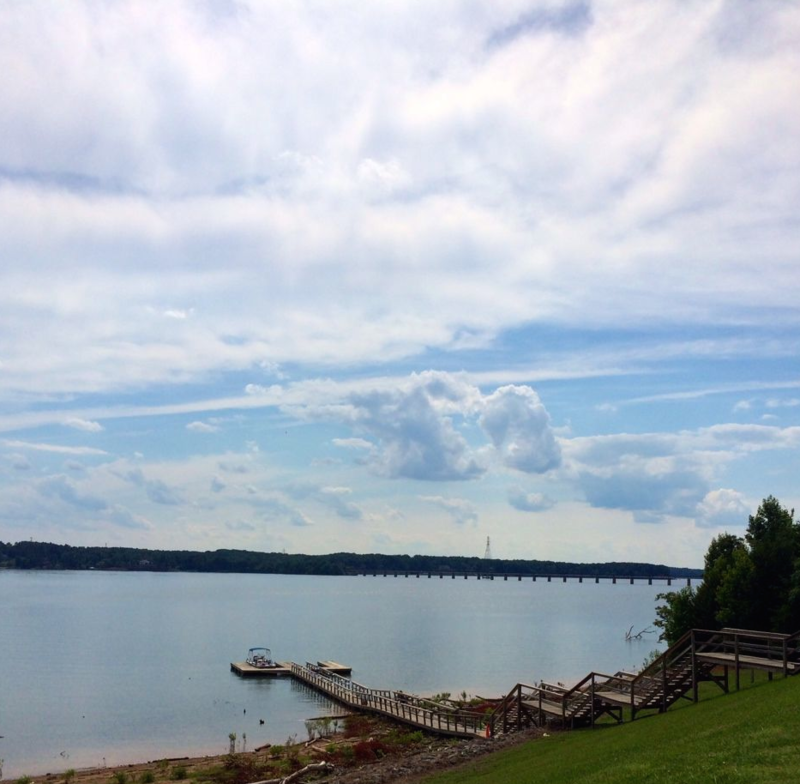 Along the way I made a pit stop in the lovely lakeside town of Clarksville. I’d done a bit of research and discovered that Buggs Island was surrounded by a beautiful river flanking beside Highway 58.
Who said Big Sky is in Montana? It’s really Clarksville, Va.
After spending some quiet time by the lake, I headed over into downtown Clarksville. I cruised down Main Street – with its antique stores, restaurants, and boutique hotels – then parked my car to do some exploring. Hall’s Gallery of Art in Clarksville. I saw a sign pointing to “English Gardens”. Growing up in a family of green thumbs, I was brought up to appreciate the beauty of a well-maintained garden. 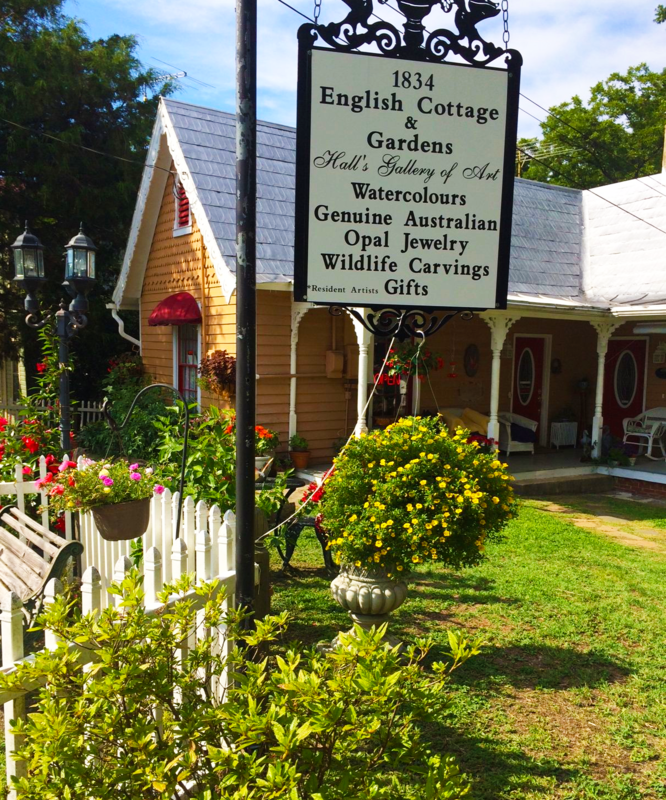 I found this lovely little garden beneath an arbor and white picket fence with an iron marquee advertising artisan jewelry and gifts. Considering I’d already logged over 500 miles, I thought I’d treat myself to a little birthday reward. Now y’all this is one of my favorite things about the South – you just never know who you’ll meet when you’re on a journey. Once I walked inside, I discovered some of the coolest jewelry I’ve ever seen. Roses, wild flowers, hummingbirds, and other pretty objects were etched into pieces of acrylic. “You can see the artist at work” an elderly gentleman told me, pointing around the corner. Inside a small room, maybe a parlor or study once upon a time, sat the artist, Don Hall. He showed us how he etched into the acrylic with a diamond tipped blade to make careful engravings, which he then fills with special dyes he manufactures himself. 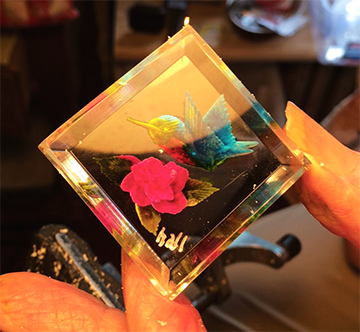 A rose and hummingbird etched in acrylic by Don Hall. Mr. Hall is 90 years old. His accent is the loveliest mix of the Queen’s English and Southern drawl. Mr. Hall spent the formidable years of his life in England moving to Canada in 1947, then to Raleigh, North Carolina in 1953 to work with Westinghouse Electric Corp. Retiring as Senior Mfg. Engineer – Rototics Automation & Mechanization. There he met his wife and love of his life Rebecca, married in 1973. He took early retirement in 1985, bought an RV and took to the Craft and International Jewelry shows with the hand carved Australian Opal and Acrylic art work. Fast forward to 2014. Don and his wife Rebecca run Hall’s Lakeside Gallery. His artwork is one of a kind. Cast acrylic was developed for windshields used in the bomber airplanes in World War II. After the war, he was looking for a gift for his mother — something incorporating red roses. He was inspired to make her the first piece which he still has today. Don showed me a china cabinet in his workshop filled with pictures and mementos from his past including photos of him when he was a little boy with his sisters, his war hero days, the fantastic moments from his life with Rebecca. I learned an important lesson that day in his shop – when you find something you love, you never retire from it. At 90, Don still wakes up everyday to come to his gallery and create more art. I shared with him that my husband’s grandfather, also named Don, is turning 90 this August. “Well it must be a good sign,” he smiled. I would have stayed for hours at the Hall’s gallery but I had to get a move on. After another hour-or-so on Highway 58, I arrived in Danville, Va. I cruised through the downtown historic district scoping out potential places for my birthday dinner. Danville is a neat little town hugged by the Dan River just across the border from North Carolina. I kept my eyes peeled for a liquor store hoping to find something for my birthday toast but I ended up at a Piggly Wiggly. Obviously, there wasn’t much of a wine section and I had to settle for a screw top. That was partly my fault. I knew better and should’ve packed a corkscrew. It’s a road trip essential, right up there with Q-tips, a journal, pen, and proper pillow (you just never know). I found heaven in this part of the South. It’s called Biscuitville. I found foodie heaven in Danville. It’s called Biscuitville. Day 3 – The next morning I got up early to investigate the biscuit situation. For folks from the metro Atlanta area who are blessed to know Martin’s famous biscuits, imagine if they served a pimento cheese and bacon biscuit. I also met some of the nicest people while waiting in line for biscuits. Talk about Southern hospitality. 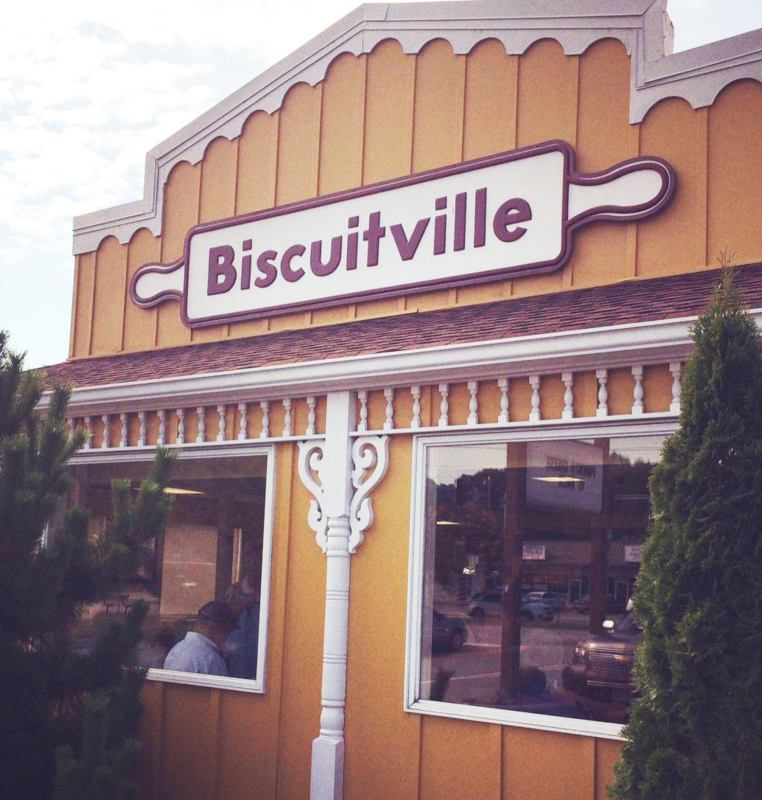 To the nice folks who own Biscuitville, will y’all please open an Atlanta location? Pretty please? After picking up biscuits for the crew, I headed out to Virginia International Raceway to see the Exomotive team in action. For those of y’all unfamiliar with the Exomotive Exocets, these bad boys are made in Atlanta – including all of the steel. The boys rocked it that day thanks to awesome engineering and a stellar driver, Zack Skolnick from Driven Steering Wheels. The Exocet by Exomotive. She’s a beauty & a beast! Day 4 – it was time to finally go home. After logging several hundred miles across four states, I felt like my 20-to-infinity was off on the right start. I cruised down I-85 for the six hours singing Johnny Cash, Loretta Lynn, The Pistol Annies, pretty much the entire “Nashville” soundtrack, and even a bit of Alan Jackson at the top of my lungs. I met some amazing people, spent time with my loved ones, saw some of the best scenery the South had to offer, watched some spectacular racing, drank about three gallons of sweet tea, and learned about the wonderful pimento cheese & bacon biscuit. Where ya from, honey? Where ya heading to? 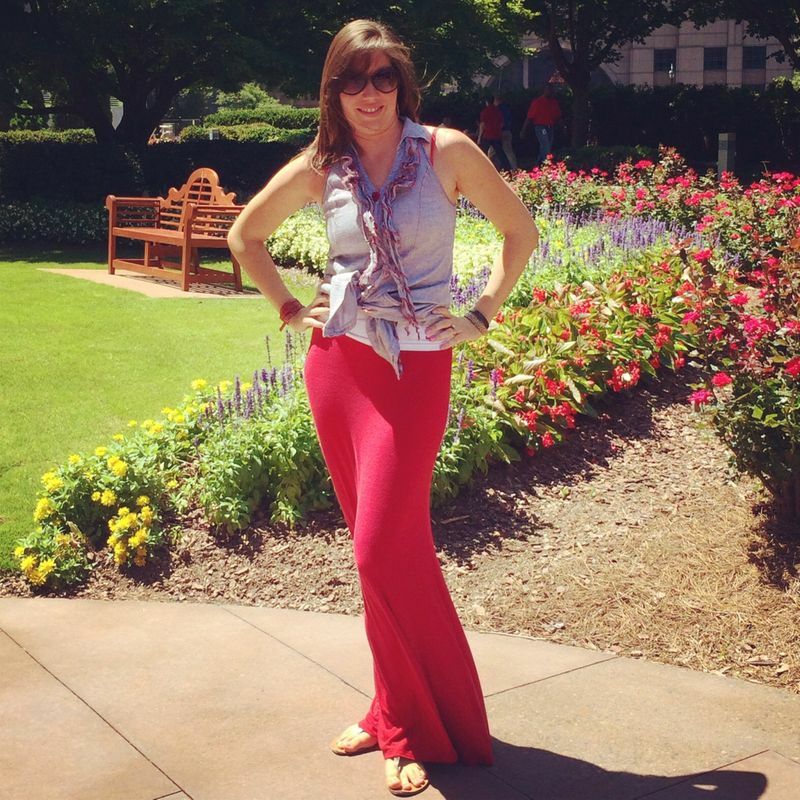 Lauren Patrick is the editor of Pretty Southern.com, a native Southerner, UGA graduate, and Georgia Bulldogs fan. When she’s not hitting the road exploring the South, y’all can find her writing, wining, and dining in Atlanta. Keep up with her & Pretty Southern on Twitter, Pinterest, and Instagram. Love this story but now I’m homesick! I live in Virginia Beach but grew up on the other side of Danville in Henry County. I couldn’t even tell you how many times I’ve traveled back and forth on Highway 58. I used to love going through Clarksville until they built the by-pass but on my next trip I’m taking the extra minutes and go through town!